Creative Assembly's new RTS will arrive at the end of September. 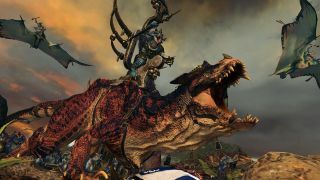 Total War: Warhammer 2 is still a month away from release, but has nonetheless already become "the most preordered Total War game to date," developer Creative Assembly announced today. More usefully, it also revealed details about the sort of hardware you'll need to actually run it. Playing at the minimum spec doesn't sound like it'll be the greatest gaming experience of all time, but there will be a good range of individual graphical settings to play with so you'll be able to balance visual fidelity and performance as you see fit. Creative Assembly also pointed out, in case you weren't aware, that "all systems perform differently," and that all of the above "should be taken as a guide rather than an absolute." And even though Warhammer 2 is now very close to release, it is still undergoing optimizations and the specs are thus subject to change. Total War: Warhammer 2 is set to come out on September 28. To absolutely nobody's surprise, the verminous Skaven were recently confirmed as the game's fourth race, joining the High Elves, Dark Elves, and Lizardmen. They sound wholly unpleasant.